Our last movie 'Sing Street' was a joyous low budget comedy set around a Dublin high school. Our next film also has a school setting - but is in a very different genre - the so-called neo noir. This is a hardboiled detective film - think Dashiell Hammett or Raymond Chandler - in which a murder is investigated and clues are followed - the twist is that here the detective is a student and the witnesses and suspects are fellow schoolmates and acquaintances in contemporary America. The script is smart - with the dialogue mirroring the cadences and jargon of the 1930s and 40s but cleverly combined with the language of modern teenagers.There is also just a touch of Twin Peaks darkness in Rian Johnson's debut indie feature - shot in his home town of San Clemente California and using as a location the very high school that he attended. This ingenious blend of of old Hollywood and new independent cinema features cool monochromatic cinematography by Steve Yedlin - the look is influenced by the classic Roman Polanski period detective movie 'Chinatown'. The music is by Rian Johnson's cousin Nathan with support from his band The Cinematic Underground. The composer draws from the tradition of noir film scores but adds a contemporary twist. 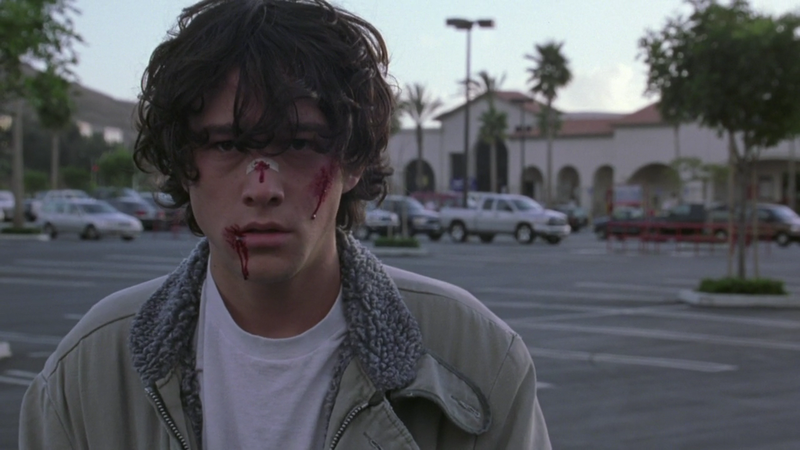 The lead role is filled by Joseph Gordon Levitt - one of the most interesting actors working today. He has appeared in big budget pictures like 'Inception' and 'The Dark Knight Rises' as well as many independent movies - always delivering nuanced and unusual portrayals. His latest outing was as Edward Snowden in Oliver Stone's recent film about the whistleblower. Director Rian Johnson's rise has been meteoric since this first film. His sci-fi time travel thriller 'Looper' was a brilliant mind-bending treat and he was subsequently selected to direct the forthcoming Episode XIII in the rebooted Star Wars franchise. 'Brick' won a fistful of awards including a Sundance special jury prize and a best newcomer at the British Independent Film Awards. February 2, 2017 by Lucas Jones.